I have so much to catch you up on that I will have to split it up into two posts. First of all, I taught my last workshop of the year (and next, since I won't be teaching in 2015) recently in San Antonio. 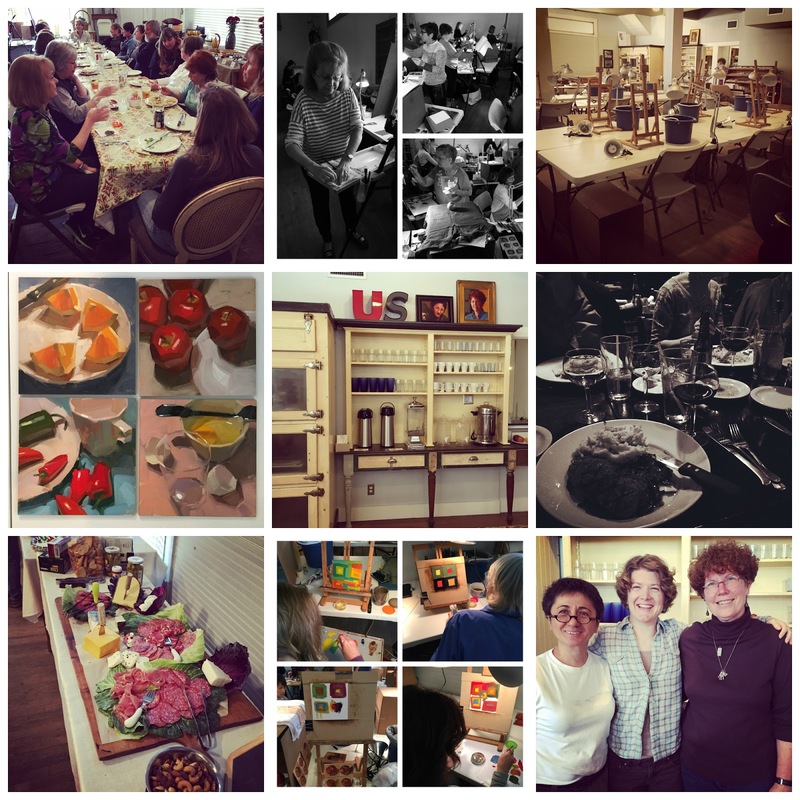 A word about the organizers - these two AMAZING women (bottom right in the next collage), who I am proud to call my friends, transformed an old corner store into a beautiful workshop venue called Whistlestop Corner, and then threw a party of a workshop! During the days we got down to business and painted like crazy people. My kids were actually really well behaved (for some strange reason), and ended up painting some lovely things! At night we either went out to eat on the Riverwalk or stayed in and watched movies. We laughed, we cried, we danced, we ate too much really good food, and generally had a good time. Here's my whole group, plus me and the organizers, looking the most serious I think we ever did all week. I'll miss you guys! What a great place to be for your last workshop of the year Carol! I loved San Antonio, an unexpected gem! And the book is fantastic, thank you so much! It's so nice to have all your great info. in one book. What a great way to end this year with such a marvelous workshop. The excitement builds as we all wait to see what you focus your painting energy on next year. One way or the other it will be a case of "lucky us"
My question is that I have found your ArtBytes and wish to purchase them. Before doing that I would like to ask if there are any further information that you couldn't include in your book? Please let me know if you think I will find more tips and information through your ArtBytes. 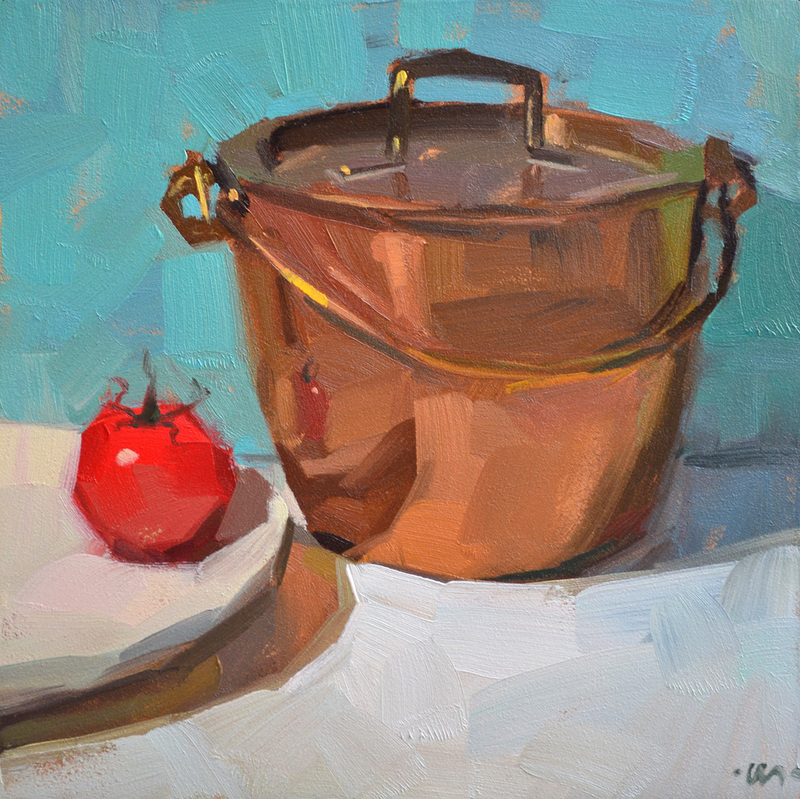 that copper pot is fantastic!!! Your book, which I'm half-way through like a delicious feast, has prompted me to pull together my paints and get some small canvas boards and..... now after a few hours, 2 paintings! You're a real inspiration. Thanks for all of your good work!